Primitive drum whallops, blurts of distorted (broken?) 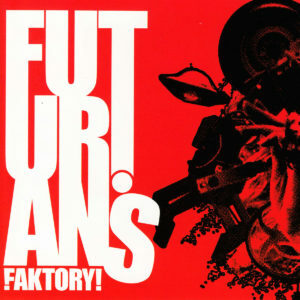 synthesizers, white noise blankets & otherworldly guitar sounds fill Faktory!, the first non-micro pressing release from Dunedin’s The Futurians. Their analog futurism recalls Wolf Eyes, The Troggs and This Kind of Punishment alike. Despite the references, Futurians really are like no other.